Home > What Is Freight Forwarding? Do you require the rapid transportation of your business cargo? Freight forwarding services ensure a high-speed delivery over long distances to ensure that your shipment reaches its destination on time. Graylaw Freight Group is one of the leading freight forwarders in the country. We can adapt our freight services to a variety of transportation methods. Regardless of the packages you need to be transported we can make sure they arrive safely and on time. We provide our services to many major cities and towns around the UK. If you need your goods transporting to and from the following UK locations, then look no further than Graylaw. We can also provide freight forwarding across the rest of the country, the Isle of Man, Ireland, the Channel Islands, Scotland and throughout Europe. We work to provide you with the most efficient and cost-effective route. By utilising these routes, we can provide the fast, safe distribution of your products to all corners of the country and the continent. While your cargo is in transit, you can keep up to date with its progress using our track and trace facility. Freight forwarders are particularly useful when next day delivery of your goods is needed. Freight forwarding is a preferred method if circumstances mean that the delivery location or the speed of the distribution method may mean cargo will not arrive on time. As well as goods which need to be urgently delivered, freight companies are also favoured by businesses who wish to distribute high-value products. This is because damage is less likely compared to regular forms of delivery transportation. The security of your packages is of paramount importance to us so you can rest assured they will arrive safely at their destination. Graylaw have built up a massive amount of knowledge of both domestic and international customs processes. This ensures there are no hiccups when it comes to moving your goods around the country or across borders to other countries around Europe. 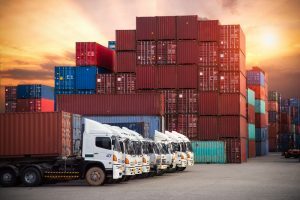 If you are going to use a freight forwarding company then it is always good to be aware that there are certain products you cannot distribute depending on your chosen method of transport. If you would like to learn more about our freight services, please do not hesitate to get in touch with our team. We have more than 30 years of industry experience to our name. To contact us call 01695 729101. Alternatively, send an email to info@graylaw.co.uk to discuss your requirements with us. We will be more than happy to answer any queries or questions you have regarding freight forwarding.